Finnish finance company Sampo is a partially state-owned finance company active in the financial markets. The company pays a generous dividend and has a 10+ year unbroken history of dividend growth, including bonus dividends. I point you to a valuation where buying Sampo would provide you with excellent yield and diversification - reasons for owning this Finnish financial giant. 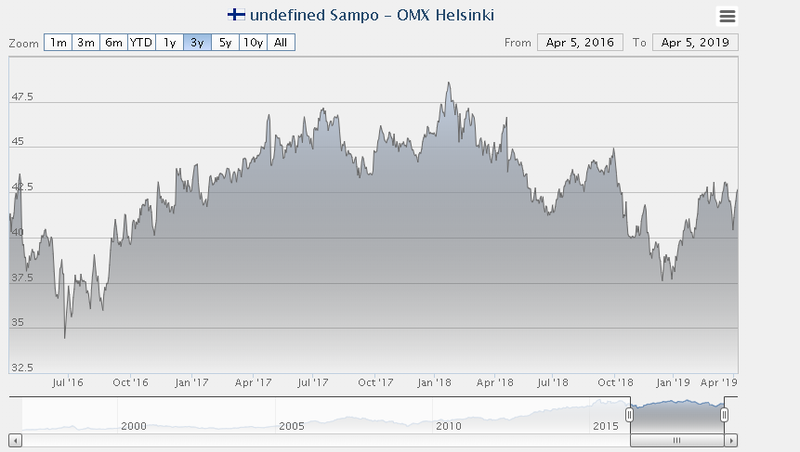 In this article, we take a look at the Finnish Finance company Sampo (OTCPK:SAXPF) (OTCPK:SAXPY). This company is a large player in Scandinavian banking, due to a large ownership stake in Nordea (OTCPK:NRBAY) (OTCPK:NRDEF), but also active in the insurance business, due to ownership of some of Scandinavia's largest insurance companies. Its uncommon ownership profile and diverse portfolio make it one of my favorite Finnish portfolio positions, currently at 3.19% of my total portfolio. I will show you why I believe this company warrants your attention and why even considering a potentially larger withholding tax, you should look into this company and consider investing in the stock. Finnish stocks are not oft spoken about - which is a pity. Our neighbors to the east have a myriad of wonderful companies in a very homogenous and predictable economy. It includes grocery companies, mineral/energy as well as financial companies - and today's focus is on the finance portion. In my view, there's no better candidate than Sampo, and I will show you why. The name Sampo is, unsurprisingly Finnish, and its meaning refers to a magical machine from Finnish mythology that was said to have the ability to create gold, flour, and salt out of thin air. The company, on the other hand, has not been around since times of mythology, but "only" for over 110 years. It started off in 1909 as a local, Finnish insurance company with the difference of offering multiple different lines of insurances under the same roof. Due to a wish for local companies - most insurance companies at the time were non-Finnish, Sampo quickly grew its business. Over the coming decades, Sampo would expand its operations to include cars as well as branch out to the Finnish countryside. New types of electrical products and household items warranted new insurances, and Sampo continued to expand. Sampo was also part of the Finnish urbanization process. The country was one of the last western nations to experience this large-scale back in the 1970s when Finnish suburbs were built in larger cities. 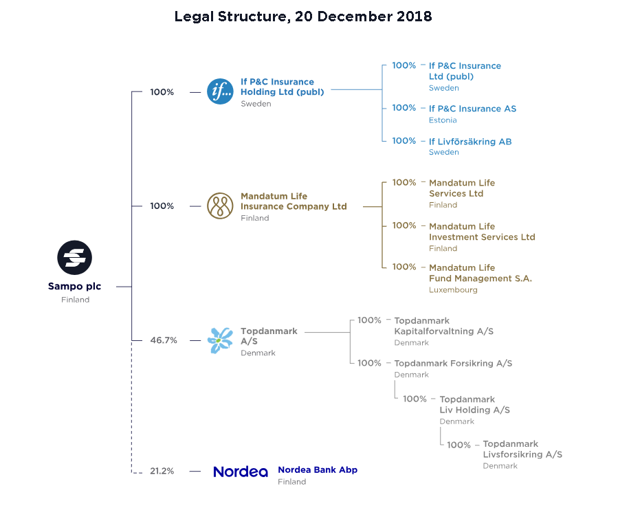 It became listed on the Finnish stock exchange in 1988 and quickly completed several transactions in which they bought competitors on the local market and grew into the largest insurance company on the Finnish market. In the beginning of the new Millennium, Sampo branched into the banking sector, buying the formerly state-owned Leonia bank. Mandatum came into the company, bringing with it group CEO Björn Wahlroos who would spearhead the company for the next 18 years and lay the groundwork for what would become the Sampo of today. P&C Insurance - the largest non-life insurance company in the Nordic region. Nordea - The largest bank in the Nordics is an associated company of Sampo, with Sampo owning 20%+ of Nordea's shares. The legal structure can be seen on the graphic below. 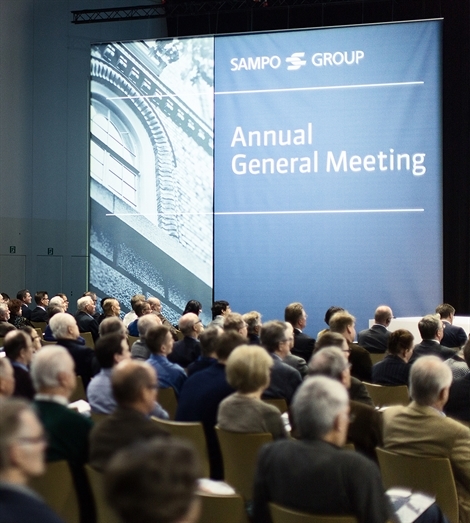 Sampo itself is owned by a variety of shareholders and institutional investors. There are, however, some quirks to go through here. The company's largest shareholders are the Finnish government through one of their state investment companies, at a respectable 10% stake. State ownership of important companies is still a tradition in Finland and can be found, among other cases, in Fortum (OTCPK:FOJCF) (OTCPK:FOJCY) as well. Let's expand on this a bit, actually. It bears some more explaining. Many of these companies, especially those in Solidium, are publicly-listed companies with long histories. Many of these are companies I own as well. Finland has a lot of natural resources and as such, many of these companies are active in mining, forestry, and chemical production. I think of Finnish government ownership much like inexpensive lobbying. The state in Finland has a tradition of wanting its companies to succeed and bring the state profit/dividends, much like any large stakeholder. Government ownership in any company is always a toss of the dice - but in Finland, the state ownership is fairly non-intrusive and, I would argue, positive. It never hurts to have the government of a nation on your side when you're trying to make money. Other major shareholders in Sampo are Finnish pension funds, as well as the now-chairman of the board, Björn Wahlroos, whose family owns a considerable, almost 1% stake of the company. Wahlroos, or "Nalle" (The Teddybear) as he's been called for almost 18 years, has been a driving force behind Sampo's long-term strategy for almost two decades now - and it's been a very positive journey for the company. In short, the ownership structure to me looks very appealing. 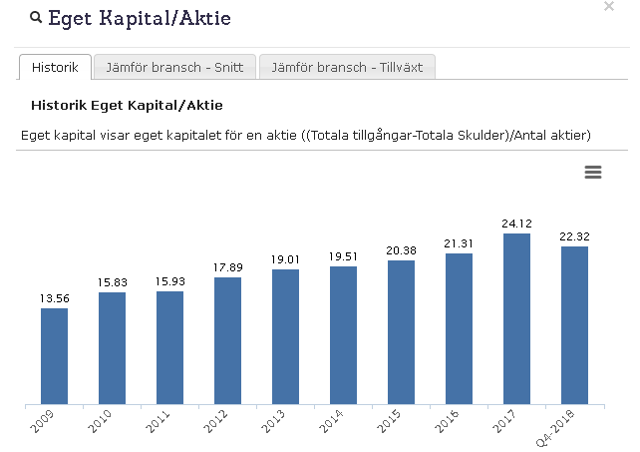 Sampo's financial performance over the years since the financial crisis has been stellar - in no small amount due to the economy having been equally stellar. We'll look at some numbers for the company, starting with profits/share development. Apart from the obvious-record year of 2017, the overall trend/pattern is profit growth since the financial crisis. Now, because this is a finance/insurance company, it's also warranted to look at book value/share and see if we can determine some book value growth for this company. We can see similar positive developments in terms of book value growth. So - the overarching financial performance of the company in terms of these simple key metrics is looking decent. Let's take a look at some more specific segment performances. IF reported record numbers for the full year, despite what the company considers to be challenging business headwinds and 2018 that ended on a very different note than it began. However, the company managed a 2.9% growth in gross premium income and the lowest cost ratio ever recorded (Source). The company's cost ratio, to name an example, has dropped from 24.3% to 21.9% in 2005 and 2018, respectively. The company also increased results before taxes for the full year by a considerable amount. Overall, IF managed some excellent operating results despite the aforementioned challenging conditions, and while there are certain areas in the company that suffer from challenges (RoE was negative for the year because of Asian/European stock markets for instance), none of these are in my view fundamental in their effect on long-term profit growth for the company. 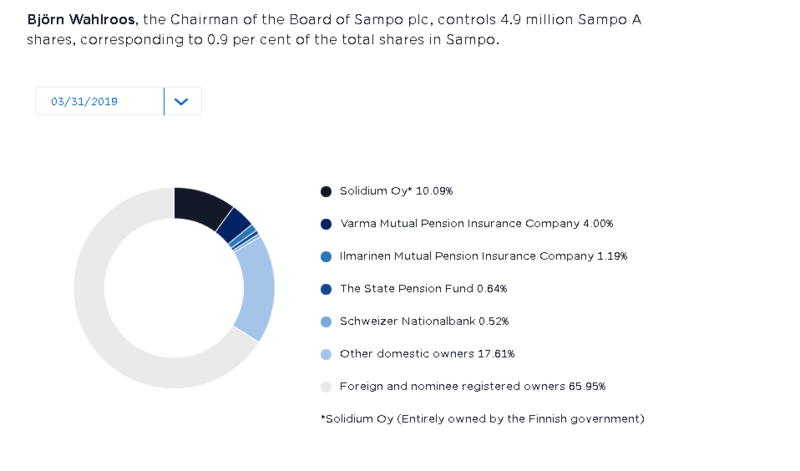 Furthermore, IF does not manage its owns investments - they are managed by Sampo themselves, who have an asset management unit within the parent company. The company had expected profits in the range of 1,200-1,300 MDKK for the year, so the 1,331 MDKK level is actually better than expected, given the financial conditions of the area for 2018. 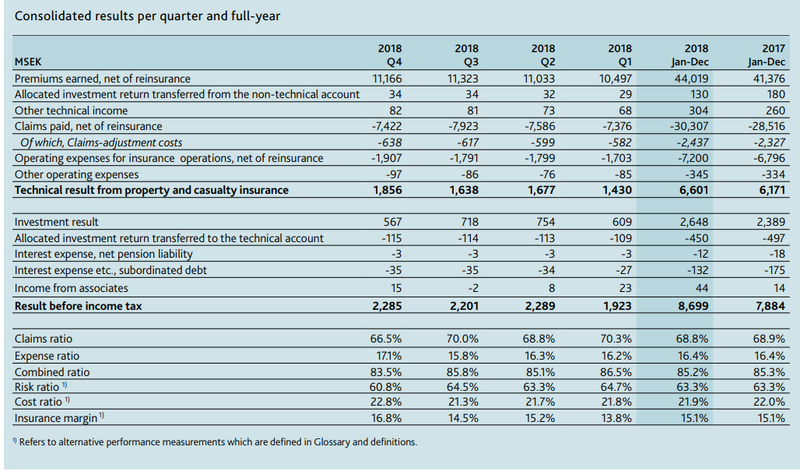 There were significant differences in 2017 that contributed to the record-high profits of that year, among other things a record-low level of claims for fire insurance due to a very cold summer (Source). 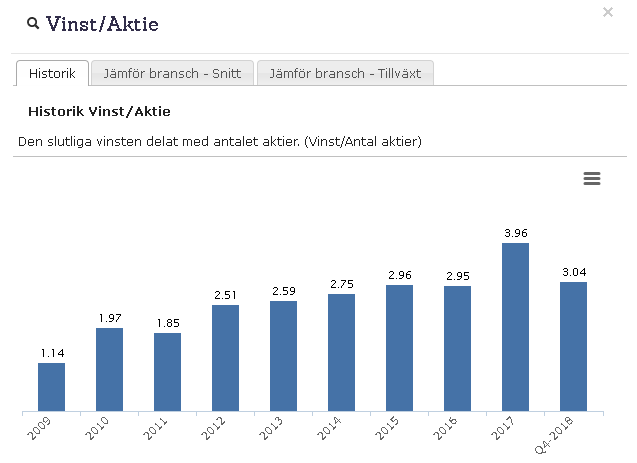 The suggested dividend distribution of 15 DKK/share represents a yield of 5.2% for the year, meaning that owning the company through Sampo actually yields a far better yield, while still getting exposure to TopDanmark. The company, unfortunately, expects headwinds to continue into 2019 and guides for a profit level closer to 2015 than 2016-2018 at levels of 1,000-1,100 MDKK. 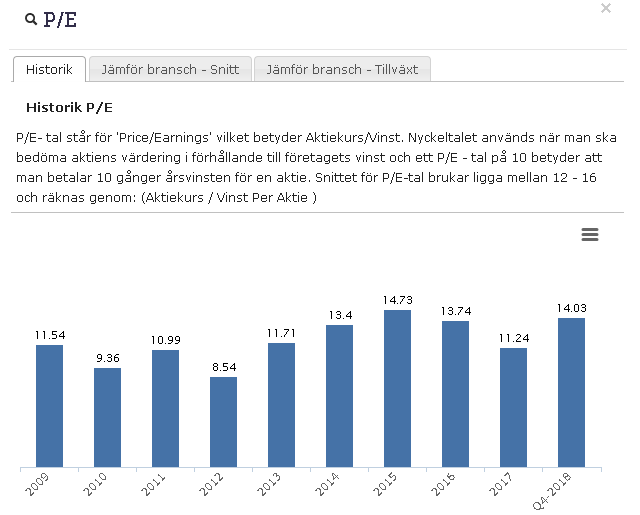 On the positive side, TopDanmark reported very low combined ratios and very nice premium growth for FY18. The company continues to hold a ~10% market share of the Danish insurance market, and their focus is private, agricultural and SME markets. They've also managed to lower their gross loss ratio from almost 70% in 2014, to 66% in 2018. While operating in a challenging market, TopDanmark is well-positioned to capitalize on future insurance market growth. As the largest bank in the Nordic region, Nordea represents an associated company for Sampo where the Finnish finance firm owns about ~21% of the shares. 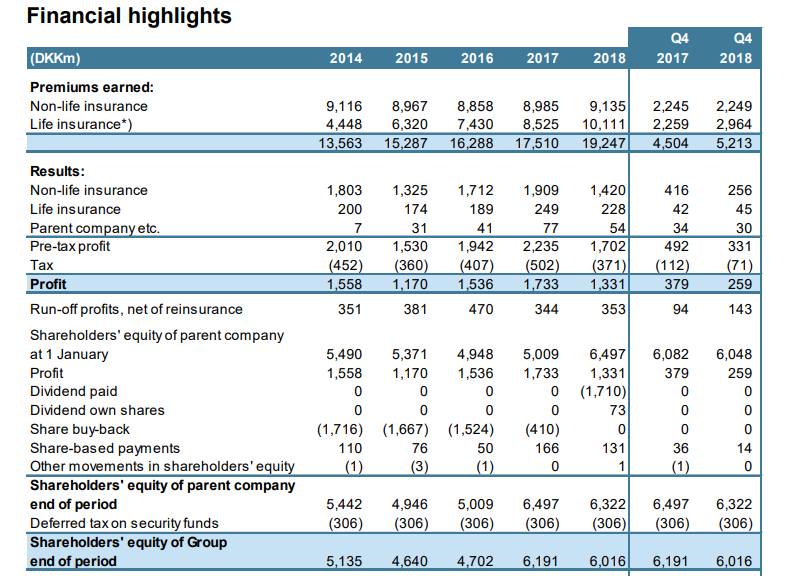 The results for the year for Nordea have been challenging. I wrote more about Nordea and their 2018 results in my article, Nordea - Opportunity Rears Its Head, and the stock has fallen somewhat more since then. 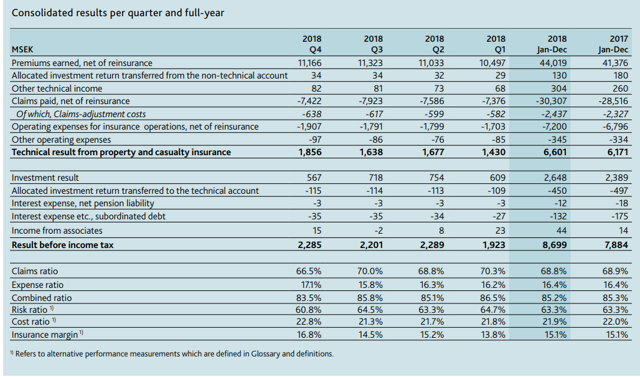 In short, the bank delivers cost efficiency plans despite revenue challenges and loss in net interest income due to margin pressure and the deconsolidation of Baltic operations. The bank is well on track on reaching its 2021 target of cost reductions of ~3%. The bank also mentions its excellent CET1-ratio, but I consider this point moot, due to the fact that if you "are" a Scandinavian bank and you do not have a 14.5-15%+ CET1-ratio, you do not belong in the segments. Standards in Scandinavia are simply higher, and this influences expectations. Nordea meets them, and I consider the bank very safe indeed. I do not own Nordea shares directly. Instead, I consider the diversification and "free" exposure towards three excellent insurance companies to be well worth the cost of admission in a slightly lower dividend yield compared to Nordea, by owning the Finnish company Sampo. The company operates in Finland and the Baltics and is completely owned by Sampo. It's responsible for all sales and functions of life insurance in these areas. The near-doubling in profit includes a contribution from the agreement with Danske bank entered during 2018. RoE for the period was unfortunately down for the full year, though the company did manage to cut expense ratio by ~2.5%. Important to notice however is that life insurance, in particular, is highly dependent on capital market developments, and the continued low rate of interest creates a problematic situation for investment in fixed income instruments, which affects not only life insurance companies but Sampo as a whole, who both are very dependent on these developments. Despite these challenges, the parent company expects Mandatum to provide good operating results for 2019. On more positive notes for the company, unit-linked premiums grew to an all-time high. Sampo itself, including all of these companies, put together and the dividends/profit garnered thereof, provided an excellent result for FY18 despite the aforementioned challenging market conditions. Group profits were €2094M (€2482M), with FY17 being affected by a non-recurring €706M related to TopDanmark accounting treatment. The company, due to profit increases (excluding the non-recurring items), increased dividends by almost 10% compared to last year. It may also pay a bonus dividend related to a legal question arisen with the change of Nordea's legal headquarters moving to Finland. The bonus dividend, when/if paid would be another €0.9/share, representing a 31% additional dividend for the year. Sampo also holds a number of investment assets, 79% of which are invested in fixed-income instruments. The company being a financial company, we're also looking at company credit ratings. Luckily, in the spirit of most Scandinavian financials, Sampo sports some excellent credit ratings both from S&P and Moody's. There is little that can happen beyond a major macroeconomic/cyclical event to even begin to threaten the stability of this company's credit and economy. Similarly, when looking at debt, the company sports a below 1.0X debt/equity (including interest-bearing assets). Gross Debt/equity-ratio for the company is 0.52X and the company has financial leverage of 34%. In short, the company's debt situation is well in hand, and the company could easily tap further credit facilities if needed. As previously stated, Sampo maintains a sizeable investment portfolio where significant amounts of capital are invested in various companies around Europe. Because they are not associated companies or subsidiaries, they are not relevant to mention for the company in their annual report. However, I feel it necessary to point some of these out, as they show what sort of company Sampo wishes to be. Intrum - Since 2018, Sampo's investment in financing/credit management company Intrum exceeds 5% ownership. Nordax - Sampo and Swedish Nordic Capital acquired a Swedish online bank specialized in consumer credit. Sampo now owns 36.25% of this bank. Saxo Bank - Sampo bought 19.9% of the shares of a Danish fintech company with a specialization in online trading. The transaction is pending regulatory approvals. These investments show that Sampo is far from inactive with its portfolio and assets. The company's sights are set on banks, fintech companies, and insurance companies. Is everything related to Sampo just fun and games? So, there are a lot of positives for Sampo. What about some challenges for this company? What are we looking at? Well, I think anyone in the business of investing in insurance business can vouch for the segment sometimes being incredibly volatile and prone to cyclical risks. Not just macroeconomic risks, but climate risks as well. Warmer climates can increase the number of claims related to, for instance, fires, as we saw in TopDanmark for some years. The same is true for colder times. There's simply no saying how a year is going to turn out for an insurance company active in these sectors. Sampo is active in them all. It's active in the Baltics, Finland, Denmark and Sweden. It has life insurance, property insurance, car insurance, personal insurance - every kind of insurance you can imagine. To say that there's no risk to this business would be to lie. Sampo is also, given its subsidiary and associated company focus, quite prone to macroeconomic and cyclical tendencies. The company states this in their own material (emphasis mine). However, the marked-to-market results are, particularly in life insurance, highly dependent on capital market developments. The continuing low interest rate level also creates a challenging environment for reinvestment in fixed income instruments. So, these are all things that need to be considered when looking into Sampo as an investment. The negatives I present are quite market-generic and not specific to Sampo as a company but to any company active in this market. This is because I had a hard time actually finding Sampo-specific risks beyond these. As of today, I do not have any that I can point to. I thought perhaps of competition, but there are no companies in Scandinavia that are trying to do what Sampo is doing. If there were, Sampo could most likely outspend them. The analysts following the stock share this view. While the occasional oddball with a sell-rating/underperform rating exists, most go towards holding/overweighing this company, much like I do myself. We can also look at some of these analyst valuations, as Sampo is quite liberal with providing these in an appealingly easy format. 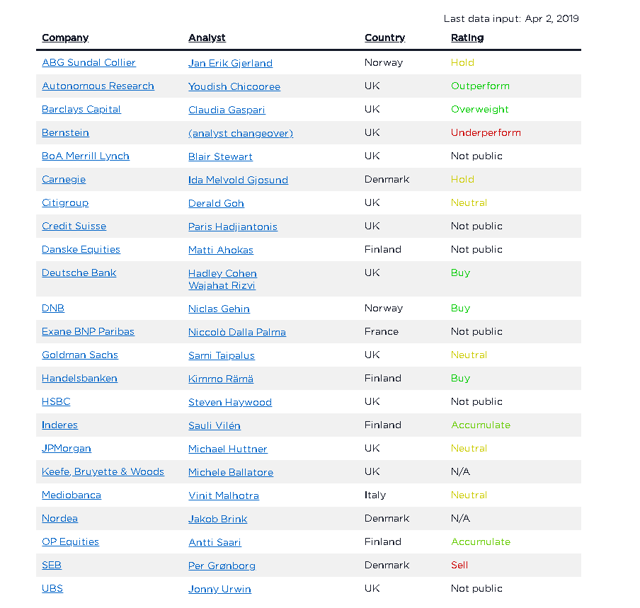 I don't personally put much stock in these analysts, as I usually end up coming up with far cheaper valuation preferences for the company I purchase. However, in the case of Sampo, some of these analysts actually approach my own price target for Sampo. To call Sampo "obviously undervalued" at this time would be overstating the case. I would consider Sampo "fairly valued" at this point, its P/B value currently being 1.9X, which I consider fair in concert with its recent growth. To compare, the highest P/B value was achieved during 2015, at 2.14, but it's been hovering around 1.84-1.91 barring that 2015 anomaly since 2014. Given that there are no companies like Sampo who invest in insurance companies, fintech, and banks, we instead have to look at insurance companies specifically. These, such as Gjensidige Forsikring (OTC:GJNSF), Protector (OTC:PSKRF), and Tryg (OTC:TGVSF) are currently valued at much higher multiples of 2.4-5.0 in terms of P/B. In terms of P/E, while not as relevant for a financial company, Sampo currently shows a degree of overvaluation when compared to historical P/E valuations. Does this mean today's stock price represents a poor time to buy the stock? Well, in the majority of the analysts' opinion, no. 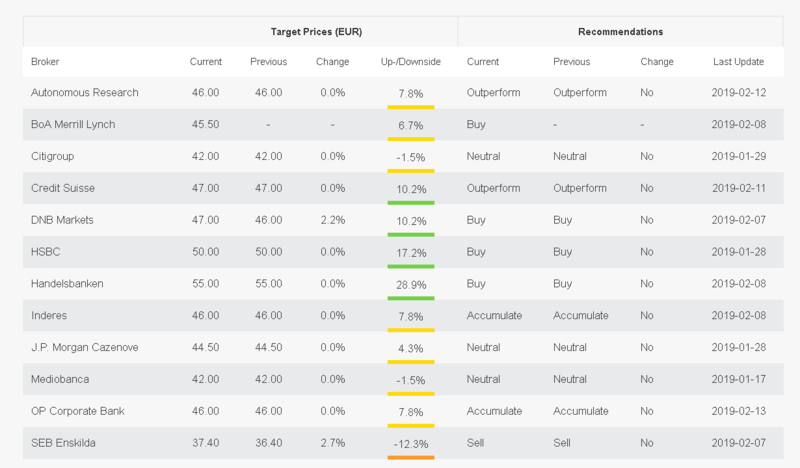 They have price targets of €50+/share, many of them. I don't share this view. While I don't consider today a bad time to buy Sampo, I don't think there's an argument against you waiting until you can buy the stock at a lower valuation, around a blended P/E of 12-13, or a share price of €38-€40. Looking at the 3-year graph, it's obvious that there's some volatility to this share due to its intrinsic connection with financial companies/insurance. If the stock drops back down below 40, that'd be my signal to expand my large position even further. These are just some of the top picks from this article, but you get the point. usually, NA insurance companies tend to pay out far less in dividends. Make no mistake, Sampo's insurance products and the markets in which they operate have a similar maturity to America. New players in insurance are rare, and Sampo's market shares, through subsidiaries and associated companies can be considered safe. Sampo is an unrelenting, no-doubt-"BUY" at anything below €40 share/a blended P/E of 14 - the lower the better, of course. It's one of only five European companies that I considered so safe, that I once considered making it part of my five-company portfolio (this was before I diversified further), and it would have represented the "high yield" position of that investment strategy. This corporation is a Finnish bedrock, and it deserves your attention. You should own this because it essentially provides fundamental insurance services to at least three nations (though more), and much like American insurance companies, its services will always be needed. But the argument here is that the company will simply provide you with much more bang for your buck - even considering Finnish withholding tax and currency risk. Thank you kindly for reading. Disclosure: I am/we are long SAXPF, SAXPY, FOJCF, TLSNF, SEOJF, TCYBF, SSAAF, KMRAF. I wrote this article myself, and it expresses my own opinions. I am not receiving compensation for it (other than from Seeking Alpha). I have no business relationship with any company whose stock is mentioned in this article.